M A R L I N B R E E - CHILDREN'S BOOKS! a children's travel and activity book can make travel both entertaining and fun. Here are three great interactive Marlor Press children's travel books for children. Kids! Write about your adventures. Have fun while you travel. With easy to use interactive pages, kids can quietly spend many happy hours writing about their very own travel adventures. Not a blank book, this educator-developed travel diary is divided into three parts: before you go, your own personal journal, and what you want to remember. Now in its revised fifth ddition, the Kid's Trip Diary comes in a handy 6 x 9 inch size with a water-resistant laminated cover. It includes enough diary pages for up to six weeks of travel, draw-your-own-pictures, travel games, puzzles & amusements as well as a whopping 150 illustrations and cartoons; more than enough to spark any kid's imagination! Only $8.99. The waterfronts of the world are ablaze with excitement. A new and ultimate race around the world, solo and unassisted, is about to take place and is drawing the best and the toughest sailors of the world. They fight their way through storms, high winds and wicked waves as they race to win. Suddenly they find boat after boat goes missing under mysterious circumstances. Who is killing off the top racers? Here's the one to get organized. Everything your boat needs to keep in shape. A lone sailor ventures into wilderness country and gets hit by the Storm of the Century. 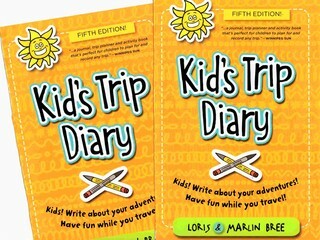 Kids can have fun recording their own voyage and travel experiences with this nifty Kid's Trip Diary. They can write about their adventures, keep a small budget, and draw pictures as well as play games. "A neat travel diary," writes the Los Angeles Times. Kids can easily learn and perform simple magic tricks and learn their educational scientific bases.